After hanging up his boots in January as the chairman of the group that he founded in 1982, Singh, still sprightly at 62, wants a share of the “wider world of business" including information technology, real estate, and education and skills development. These businesses will be launched as new units under Max Ventures and Industries Ltd (MVIL), in which Singh holds a 40% stake and has made an open offer to raise it to as much as 70%. Singh’s son-in-law Sahil Vachani is managing director of MVIL, which is expected to be listed on the BSE in May. “...we are calling it an opportunity to address WWOB—wider world of business, which means that today if somebody comes to us and says, have you thought of this and that, and, we can say, yes let us talk. Earlier, we did not do it, because we did not want to get distracted (from our core business)," Singh said at a press conference in January. In January, Max India split into three separate units: life insurance; health and allied businesses; and manufacturing, in a restructuring exercise aimed at unlocking shareholder value. Singh seems to have rediscovered the zest he seemed to have lost then. He said: “There was not a day when I did not get a call saying we have got a great business idea. I always said I don’t want to listen. They said: that’s not you. I said: that’s the new me." 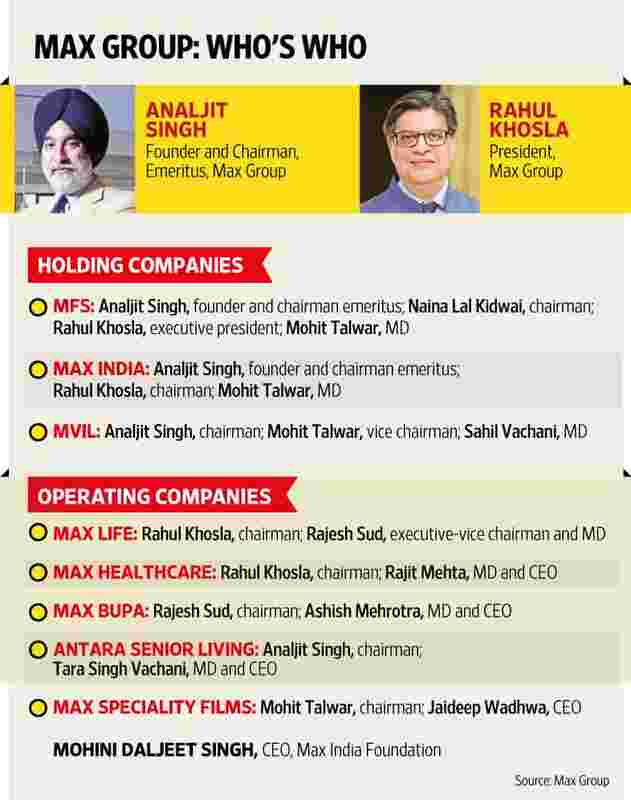 In January, Max Financial Services Ltd was mandated to focus solely on the life insurance business—a joint venture with Mitsui Sumitomo Insurance Co. Ltd.
Taurus Ventures Ltd was renamed Max India Ltd and given the job of managing investments in the healthcare and allied businesses, with three subsidiaries—Max Healthcare, Max Bupa and Antara Senior Living. MVIL, formerly Capricorn Ventures Ltd, was given oversight of the group’s manufacturing subsidiary, Max Speciality Films—a packaging films business. In addition, it was also mandated to explore fresh ideas for new ventures in the “wider world of business". “In a way, it is like re-starting his own (Analjit Singh’s) entrepreneurial life yet again, protecting the parts which have already been built. That’s the essence of the demerger," said Rahul Khosla, Max Group president, about Singh’s new plans. This is not the first time that Singh has tried to diversify his business interests. Since he returned to India from the US with an MBA from Boston University to start Max India in 1982, Singh has acquired a reputation for being a compulsive serial entrepreneur. Over the following two decades, he entered and exited as many as 10 joint ventures and as many businesses. His telecom venture delivered him the highest return—Singh made ₹ 561 crore in 1998 by selling his 41% stake in a joint venture with Hutchison Whampoa Ltd; the sale gave him the capital to set up successful businesses in the health insurance and healthcare sectors. Those units now have a cash pile of ₹ 2,500 crore. Cannily, Singh is again exploiting opportunities presented by a changing regulatory and business environment. For instance, real estate, in which the $2 billion group already has a play through Antara, a residential community for senior citizens in Dehradun; it will focus on specialization and niches as it expands. Khosla talks of doing real estate “the right way", for too long the sector has been associated with opaque and unsavoury practices and a lack of trust and confidence between consumers and developers. The Real Estate Bill passed recently by Parliament is designed to protect consumer interest, ensure efficiency in all property-related transactions, improve accountability of developers, and attract more investments to the sector. “The recent Real Estate Bill also makes it very transparent to do business", Khosla said, refusing to share details about planned investments and business structures. The group remains open to the idea of bringing in capital and partners depending upon opportunities in real estate, a sector that is fighting for recovery after being in a prolonged slump. Even high-end homes for senior citizens have had few takers. “Senior living market is in the very nascent stage. It is still confined to larger city clientele. It is aimed at high-income group retirees. It is growing but the base is low," said Ashutosh Limaye, head of research and the real estate intelligence service at property consultant JLL India. China and India are projected to be home to almost half of the 1.3 billion senior citizens inhabiting the world by 2040. With India already hosting around 100 million senior citizens, there clearly exists an untapped opportunity for investment and development of homes for retirees. A continued slump in the real estate sector could prove to be a dampener for Singh’s real estate plans. High interest rates, incomplete projects and delays in the delivery of apartments has caused home buyers—both investors and end-users—to shun purchases, leaving many developers with unsold inventory. MVIL is looking at other areas as well, but Khosla said details of these possible ventures are still being fine-tuned. “We are exploring skilling, education," Khosla said. “We are exploring participation in IT in terms of technology. So, those are the kind of areas which we are thinking about in terms of what we need to do." Shine Jacob in New Delhi contributed to this story.